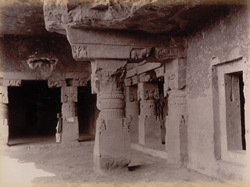 Photograph of the Dhervada cave at Ellora from the Curzon Collection: 'Views of Caves of Ellora and Dowlatabad Fort in H.H. the Nizam's Dominions' taken by Deen Dayal in the 1890s. The spectacular site of Ellora, in Maharashtra, is famous for its series of Hindu, Buddhist and Jain cave temples excavated into the rocky façade of a cliff of basalt. The works were done under the patronage of the Kalachuri, the Chalukya and the Rashtrakuta dynasties between the 6th and the 9th Centuries.The single-storey excavation in this view is in the southernmost group of the Buddhist caves, and dates back to the 7th Century. It consists of a long spacious hall or vihara which was used as a Buddhist monastery as it is indicated by the residential cells cut into the side walls. The two long lines of benches carved out of the floor were probably intended for the use of the monks when studying or dining. The hall is divided into three aisles by two rows of columns. The columns have part fluted shafts and cushion capitals with exuberant foliage.